The event at the First Amendment Museum at the Gannett House included discussions of political, student and online speech. AUGUSTA — As Free Speech Week gets underway across the nation, people came to Augusta on Tuesday evening for a special event to educate them about the various ways that the First Amendment has a bearing on their lives. 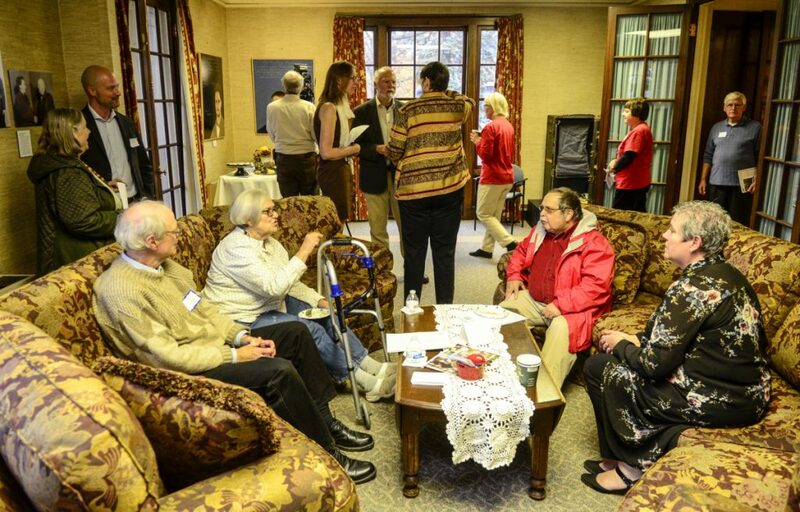 The group gathered at the First Amendment Museum at the Gannett House, where legal experts, professors, journalists and others led discussions on questions of free speech that can arise in three arenas: politics, education and the internet. 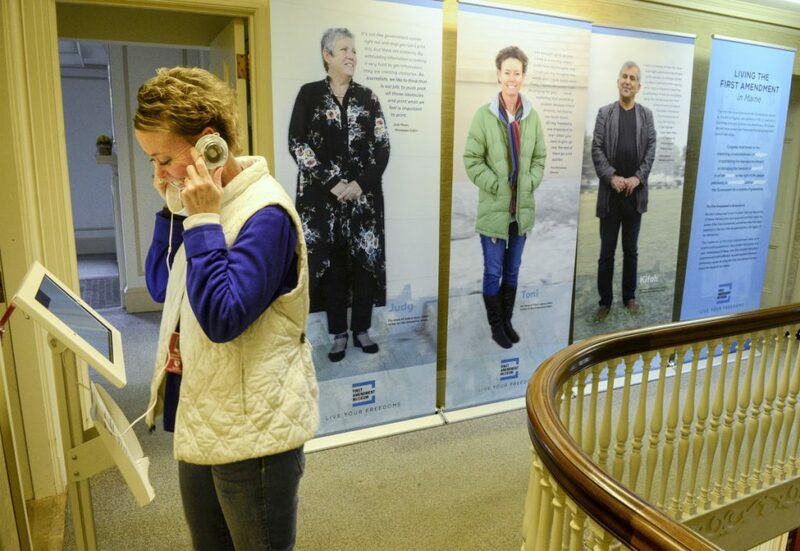 Under portraits of figures who have championed various manners of free speech — including whistleblower Edward Snowden, former U.S. Sen. Margaret Chase Smith and civil rights activist Barbara Johns — attendees were given written prompts with ideas to guide their discussions. They included numerous questions, such as whether social media platforms should monitor users’ activity or whether a school can punish a student who didn’t make an explicit threat but posted an online video depicting violence. One organizer of the open house was the New England First Amendment Coalition, a Massachusetts-based organization that promotes transparency in government. Another organizer was the group that runs the museum, the First Amendment Museum at the Gannett House. The yellow stucco building at 184 State St. used to be the home of newspaper publisher Guy P. Gannett. Now Gannett’s relatives are leading the effort to create a museum focused on free speech. The museum hasn’t opened to the public fully yet, but organizers hope it will by 2020, said Rebecca Lazure, executive director of the First Amendment Museum at the Gannett House. Until then, the group plans to make it available for events periodically. People who came to the museum on Tuesday night did so for various reasons. One of them, Toni Richardson, is an educational technician in the Augusta School Department. Last year, she filed a complaint alleging that the school district discriminated against her when she told a fellow employee she would pray for him. The district eventually agreed to withdraw a directive that Richardson not make those statements and replace it with an affirmation that she can do so outside the hearing of students. Richardson’s case now is highlighted in the exhibits that are being developed at the First Amendment Museum. Another attendee, Keith Ludden, of Augusta, used to work as a journalist in his home state of Nebraska. Now he runs a nonprofit organization that produces oral histories and folklife research. Ludden came to the open house, he said, to help affirm the protections of the press and political protest that are contained in the First Amendment. He referred to President Donald Trump, who frequently berates the press and recently praised a Montana congressman who pleaded guilty to assaulting a newspaper reporter. He also mentioned the case of deceased Saudi journalist Jamal Khashoggi. On Tuesday, Turkey’s president accused Saudi officials of murdering Khashoggi following their assertion that he was killed accidentally during an altercation. The Portland Media Center and Gorham radio station WMPG also organized the event.